Many computer vision algorithms rely on precise estimates of scene radiances obtained from an image. A simple way to acquire a larger dynamic range of scene radiances is by combining several exposures of the scene. In this project, we have developed a simple algorithm that computes the radiometric response function of an imaging system, from images of an arbitrary scene taken using different exposures. The exposure is varied by changing either the aperture setting or the shutter speed. Unlike other similar algorithms, this one does not require precise estimates of the exposures used. Rough estimates of the ratios of the exposures (e.g. F-number settings on an inexpensive lens) are sufficient for accurate recovery of the response function as well as the actual exposure ratios. The computed response function is used to fuse the multiple images into a single high dynamic range radiance image. We have made our algorithm, called RASCAL, and several multi-exposure image sets available online. We have also developed a simple visualization tool that enables one to explore the richness of a high dynamic range image on a low dynamic range display. The number of exposures taken and the values of the exposures have a significant impact on the quality of the computed high dynamic range image. In the second part of this project we have addressed the following problem: Given a camera with known response function and dynamic range, find the exposure values that would result in a set of images that when combined would emulate an effective camera with a desired dynamic range and a desired response function. We first proved that simple summation combines all the information in the individual exposures without loss. We selected the exposures by minimizing an objective function that is based on the derivative of the response function. Using this algorithm, we demonstrated the emulation of cameras with a variety of response functions, ranging from linear to logarithmic. Our approach makes it possible to construct a table of optimal exposure values. This table can be easily incorporated into a digital camera so that a photographer can emulate a wide variety of high dynamic range cameras by selecting from a menu. 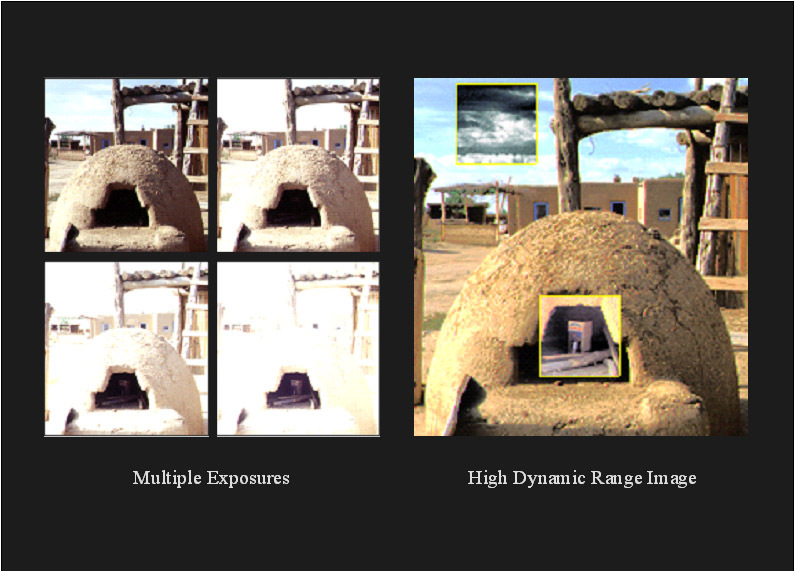 "High Dynamic Range from Multiple Images: Which Exposures to Combine?,"
These pictures show the multiple exposures captured for an outdoor scene and the high dynamic range image computed from them. The highlighted image windows have been histogram equalized and they reveal the objects inside the oven and the clouds in the sky.